Chris Engman, "Double Skew," 2013, pigment print, 86 x 33 x 4"
Photography is so pervasive in contemporary art now that sometimes talented practitioners get overlooked, or their vision seems so photo-specific that viewers often don’t get the point. So it is with Chris Engman, the 36-year-old Los Angeles-based artist. Highly intellectual yet often hypnotically beautiful, Engman’s images carry photography forward into new worlds that disorient, please and frustrate the visitor willing to engage with the 13 large-scale prints. Layers of in-jokes about postmodern aesthetic theory, photography’s faults and virtues, the instability of perception and so on are summoned up once one enters an Engman. Enter, because each new work has pictures of windows, doors or frames we must “pass through,” into the picture’s ambiguous indoor or outdoor space. 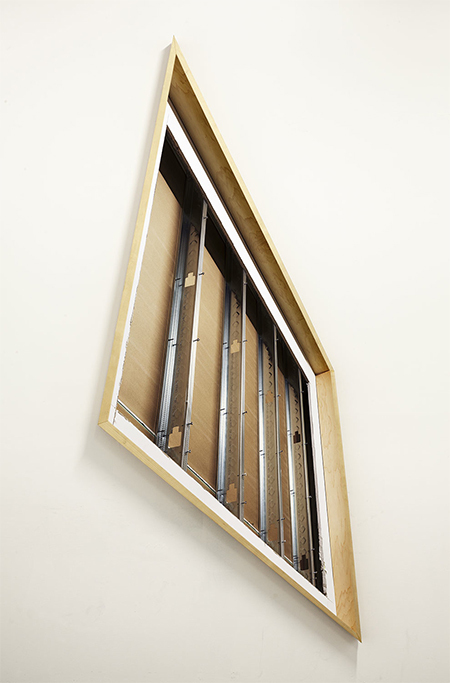 Acclaimed by Financial Times art critic Rachel Spence in a review of “Uncommon Ground,” a group show at London’s Flowers Gallery in 2012, selections from Engman’s earlier style, as in “The Claim” along with “Relocation,” are included here. The latter work consists of a pair of color prints of a marked-off section of beach and the same section of some sand and pebbles behind a gilt frame. Both works are of a beautiful “assembled” rocky landscape; pioneer earth artist Robert Smithson’s photographs of industrial rubble in New Jersey and Utah is a strong influence. Leaving aside such strong but derivative work, Engman has lately turned even more cerebral. In the new work there is a strong dose of illusionism along with wisps of the old “constructed moments” art movement, a.k.a., “set-up” photography, but with a more ironic or humorous slant, reminding us again: Nothing is what it seems. Bard College writer and curator Fionne Meade praised Engman for his “absence of self-conscious preening,” but that isn’t exactly the case with the large new photographs of various cut-up abstract paper constructions; inverted paint-drip samples; and, most self-conscious of all, huge irregularly angled, framed prints of metal wall struts and shelves of art materials. You get it: giant photos that become art about the making of art. If they are now art about art, at least they look more like art than dolled-up document. Engman has traded 1970s earth art for the 1980s “art about art” mini-trend as historical source material worth mining. In “Ink on Paper” the inverted paint drips of primary colors recall Jasper Johns’ reductive drips of primary color paints. “Corner Cube,” “Paper” and “Disruption” use white-on-white Suprematist cubes to send up the Russian avant-garde, going so far to offer a retort to V. Tatlin’s “Corner Counter-Relief” (1914) with an angled frame that wedges into a corner of the gallery. The faked shadows in this work and the other two come close to teasing out three dimensions before the eye pulls back in disbelief. “Surface,”a giant pile of shredded documents contained in a photo of a box could be another take-off: Mark Tobey’s “white writing” seen through the eyes of a very tired office-worker. In such a crowded field — contemporary art using photography — Engman is slowly carving out his own niche; each show is a bit less unoriginal than the last. No longer what Seattle Times art critic Michael Upchurch wincingly called a “heady visual treat,” Engman’s new work is more direct and less of a puzzle beyond a given optical trick. Building on such recent strengths and group shows in Munich, Los Angeles and Milan, Engman has worlds to conquer. With eco-landscape photography and set-up photography under his belt, one does look forward to whatever this ultimately uncategorizable artist may re-discover next.